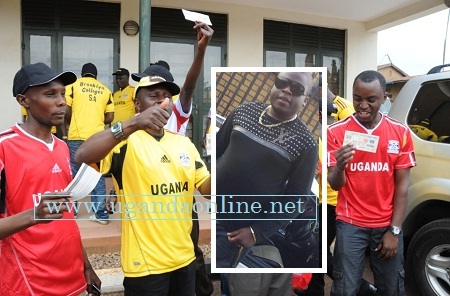 In 2007, sports philanthropist and Uganda Cranes fan Mike Ezra came with a chopper at Namboole to watch the game between Uganda Cranes and Nigeria. On winning, he gave them millions of shillings. This is exactly what Zari's ex Ivan Ssemwanga did. He was dropped by a blue chopper into a hummer that brought him to the gates with his 'fans' cheering him on. Earlier on Ivan had donated Shs10m to the Uganda Cranes and promised Shs5m for every goal scored. This means that with Geoffrey Massa's goal in the first half, this will be an additional Shs5m. It could have been even better had the Uganda Cranes taken on the African Champions team Chipolopolo who won by 9 goals to 8 in a penalty shoot-out. Ivan is trying to assume Mike Ezra's position just as Zari took over Bad Black's social scene. Meanwhile, he sponsored 10 fans from South Africa with return Air tickets just to come and watch the Uganda VS Zambia match in Namboole.